Join us on a trip to a port city dubbed Greece’s “gateway to the west”, famous for its colorful carnival and much more. I had arrived in Patras just before the city’s celebrated carnival. Spring was still some time away and the wind was bracingly refreshing. As I approached the massive carnival workshop at Petroto, I was hit by the strong smell of paint and chemicals wafting through the open windows. Inside, craftsmen were putting the final touches to the giant float of the Carnival King, which this year is Eastern-inspired, with a Thousand and One Nights theme. In previous years, there would have been at least 40 people working here. Today there are only 10. That’s the crisis for you. But the result has to be the same. 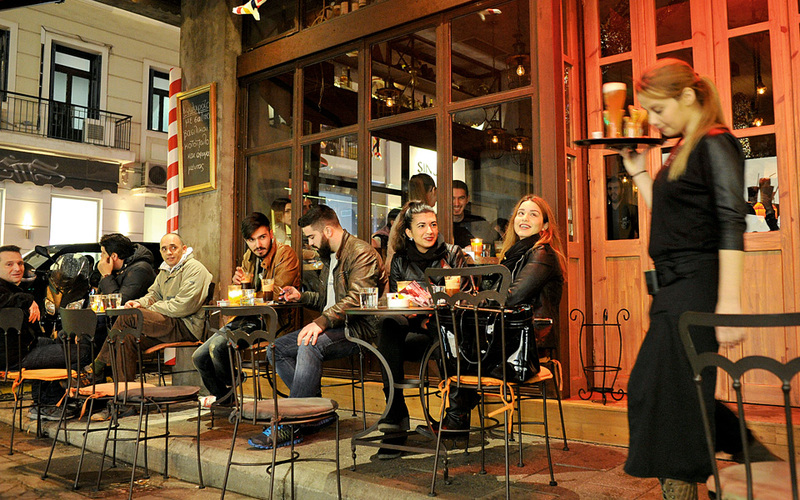 The grand parade must fulfill the expectations of locals and visitors alike. 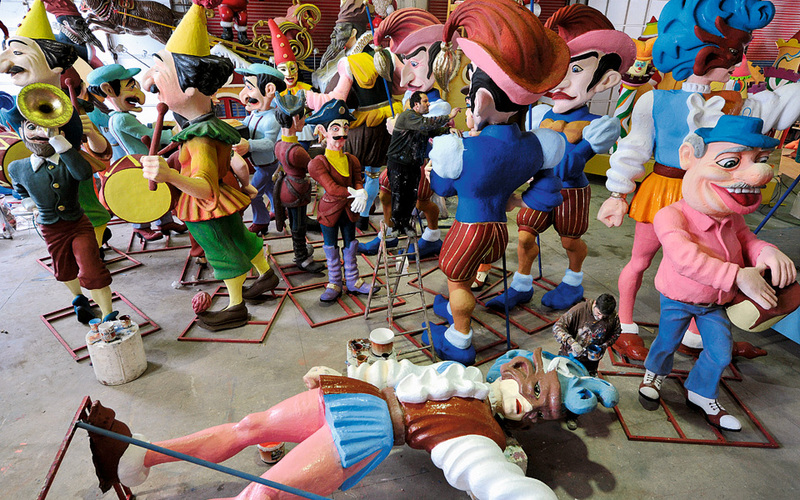 A custom deeply rooted in the minds and hearts of the people of Patras, the carnival has always served as a beacon of hope for them, even in the most difficult times and even when some were bitterly opposed to it. For instance Theodoros D. Pangalos, soldier, politician and dictator, who in 1926 prohibited masks (and short skirts!) and limited the opening hours of the entertainment venues. But for the 225,000 inhabitants of Greece’s third largest city, the carnival has never just been about partying; it is an occasion for getting together and creating. “It doesn’t want spectators, but participants. It cannot be described, only experienced,” they say. Work on the 240 floats this year has taken a full year. And on Sunday night, the ritual burning of the Carnival King will signal the start of the next carnival. But Patras is not just about the carnival. To say so would be doing the city an injustice. Rafaella, Maria and Marios are Cypriots studying medicine. We found them at the Locale, heads bent over books and laptops, preparing for exams. The modern premises on Aratou street, which in the last century housed dozens of raisin storage facilities, today is just one of the city’s many study rooms, such as Tag on Aghiou Andreou street and Discover on Ermou. It’s the latest trend, with a new one appearing every so often. They have specially laid out areas with reading benches and free Internet access for those wishing to study with friends. They serve coffee, pastries (Locale is famous for its cupcakes) and a selection of dishes. “Who would study at home alone when you can have all this plus the help of fellow students when needed?” asks Yannis, who is studying electrical engineering. Painted arcades in the center of the city...15km long! 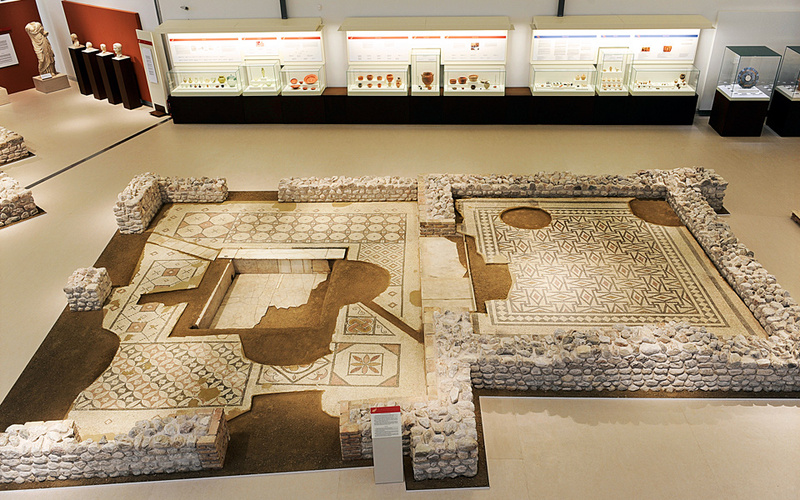 Since the university was founded 50 years ago, students have breathed new life into Patras. “It’s something familiar, in our hearts. Like the carnival and the Church of St. Andrew. For decades now it has been a crutch in difficult times,” says Nikos, a municipal worker. It may sound like an exaggeration, but it’s quite true. The capital of Achaia had already experienced a crisis, years before the one that has recently hit Greece. It had begun in the mid-80s, with a painful process of deindustrialization. In the space of 10 years, 200 large industrial concerns had closed in the greater area, leaving more than 30,000 without jobs. But this was not the first crisis in the city’s modern history. In the late 19th century, the so-called currant crisis devastated the merchant class, which had displayed its wealth by constructing elegant residences and public buildings. Some of the houses around Olgas Square even had gold door handles! But fortunately, Patras always manages to adjust to new conditions. And this is true today, as the city has become one that chiefly provides services. This is plain to see wherever you go, first of all in the dozens of cafés, fast food outlets, restaurants and bars, especially on pedestrian-only Riga Ferraiou, a popular meeting place for youngsters, which leads to the imposing Church of St. Andrew, a major monument of Greek Orthodoxy and pole of attraction for thousands of Russian tourists who arrive on a pilgrimage each year. The successive changes in social and economic life are evident in every corner of the city, in its buildings and streets. When liberated from the Ottoman Turks in 1828, it was almost deserted, with just 4,000 inhabitants. The Upper Town, the neighborhoods around the medieval castle, was home mainly to domestic migrants from villages in the surrounding region. 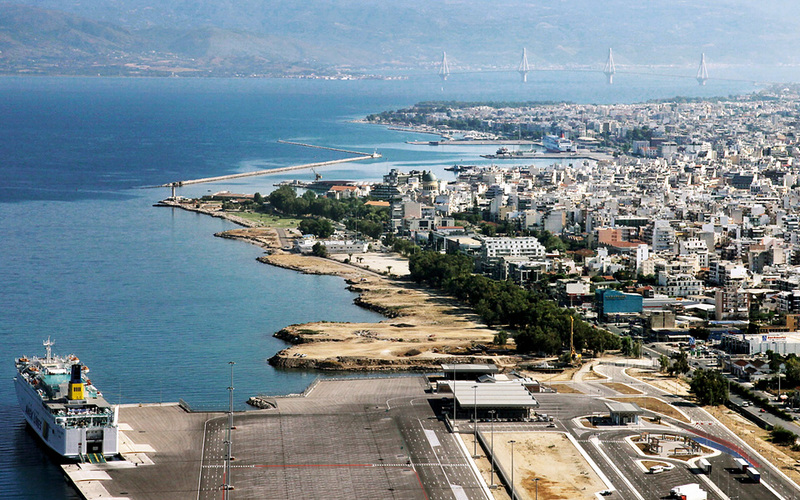 The Lower Town was the vision of Ioannis Kapodistrias, the first governor of the modern Greek state, who envisaged a maritime gateway developing in parallel with the port, trade and interaction with Athens and the West. 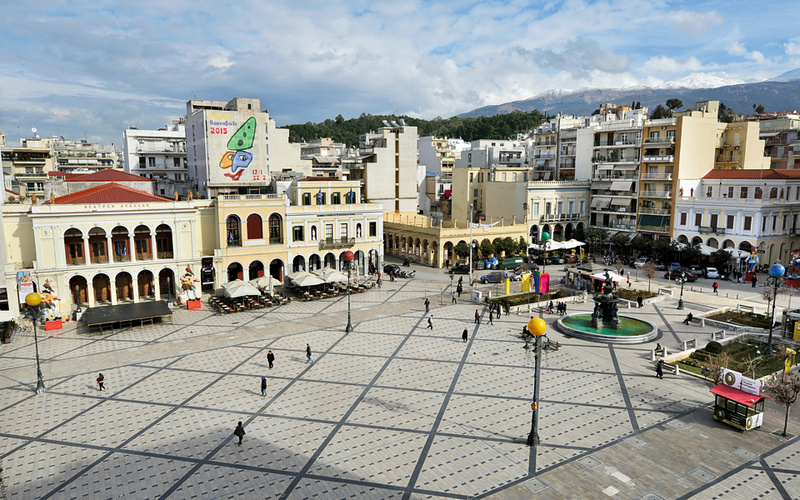 What visitors see today – a fine example of town planning with rectangular blocks surrounded by straight roads and symmetrically placed squares – owes its success to the then pioneering urban design devised in 1829 by the Corfiot engineer Stamatis Voulgaris at the request of Kapodistrias. Wishing to express their gratitude to the governor, local notables proposed renaming the city to Ioannoupolis. The governor declined. 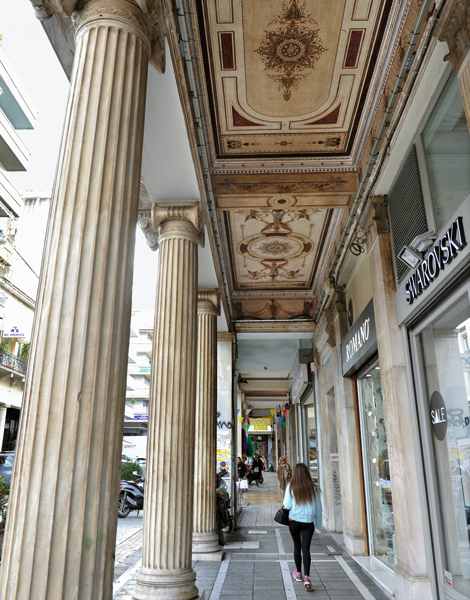 Only very few of the buildings that marked Patras’ urban coming-of-age in the following decades – as it transformed into a multi-ethnic, cosmopolitan, outward-looking city with its own brand of joie de vivre – have survived. Among them are the Apollon Theater, the building housing the “Hermes” Trade Association and the Thomopoulos Mansion in Georgiou I Square. Others are now surrounded by apartment buildings that began to spring up in the ‘60s. 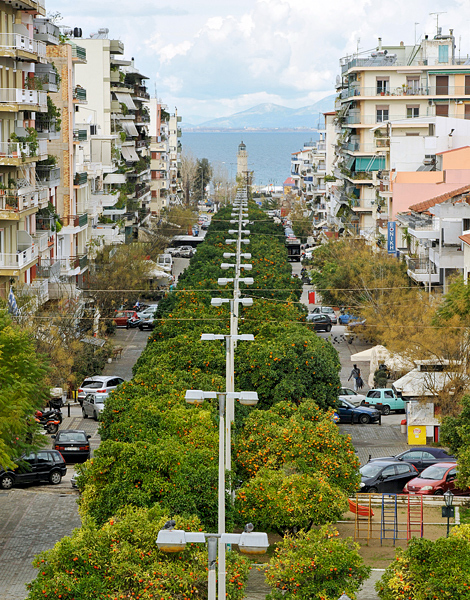 The same is true of Othonos-Amalias Avenue, which separates the port from the city center. Up until the late ‘50s, it still retained most of its activities. Products from the surrounding region would be processed at facilities along the avenue before being transported to the busy port. The old lighthouse was finally lost in 1968, as too were the black granite paving stones. The new, ultra-modern port has relocated further south and it remains to be seen how the prime 8-kilometer coastal stretch will be developed, or perhaps more importantly, by whom.